Juanita Gumbs, who gave birth to a baby on New Year’s Day at the Scar borough General Hospital, is presented with a hamper by staff at the hospital and the Tobago Regional Health Authority officials, from left, midwife Beverly Baptiste, TRHA Chairman Ingrid Melville, acting Medical Chief of Staff, Dr Victor Wheeler, acting TRHA CEO Michelle Edwards-Benjamin and acting Secondary Care Nurse Manager Sarah Celestine Balfour, at the Maternity Ward of the hospital. Juanita Gumbs was the first of two mothers to give birth to babies at the Scarborough General Hospital on News Year’s Day. Gumbs and Dwayne Nicholls of Milford Road, Bon Accord, welcomed a baby boy at 1.41 am. 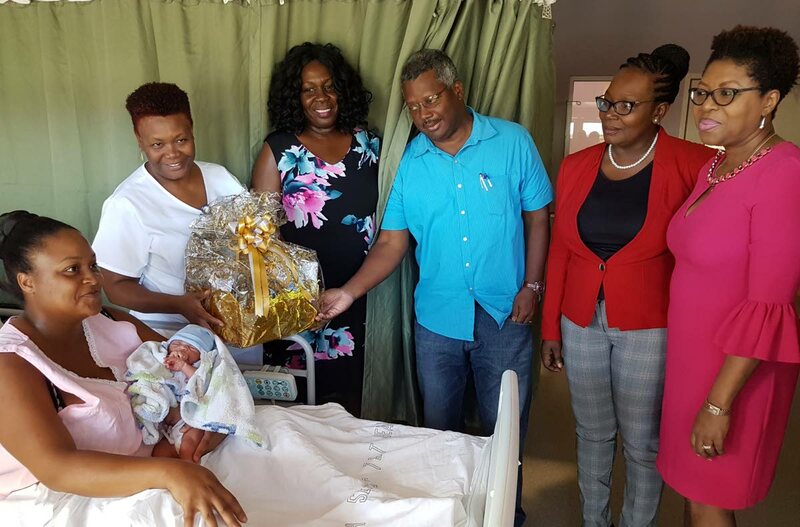 Gumbs, an enrolled Nursing Assistant at the Geriatric Unit of the TRHA, said she was excited at the birth of her third boy, whose brothers are 10 and 5 years. She had some advice for other mothers. “Aim for the stars. Do what you have to do. Life might be tough, but you have to do what you have to do. Make sure you’re educated,” she said. Shehad high praise for the doctors and nurses at the hospital. “My doctors were excellent; Dr Keshi, Dr Peterson and Dr Wheeler. They took very good care of me. I was a bit scared at first with the C-section but it turned out to be good. They were very supportive. The nurses, too, Nurse O’Neil, Midwife Marge Taylor, all the midwives on shift; they were born very, very supportive,” said Gumbs. The second baby boy was born at 7:23 am to Stacey and Neil McLetchie of Buccoo. This is their fourth son, with the other three aged 15, 12 and 8. 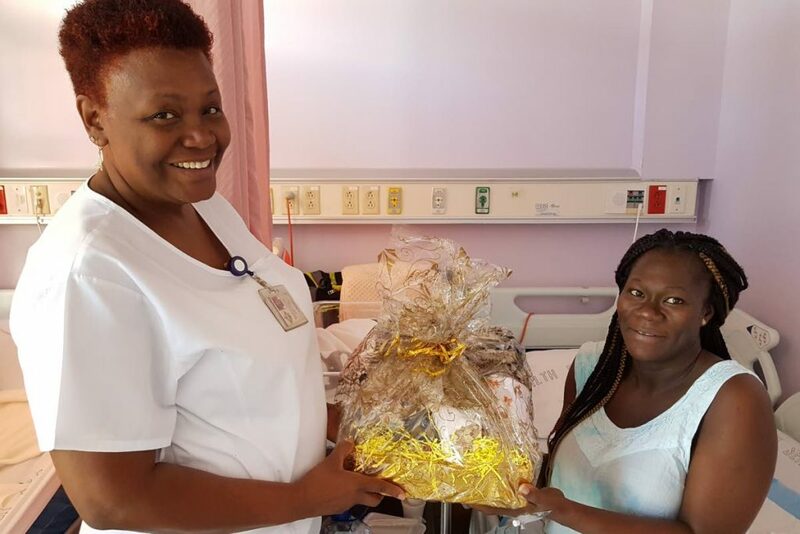 Midwife Beverly Baptiste presents Stacey McLetchie with a celebratory hamper on the birth of her baby boy on New Year’s Day at the Maternity Ward of the Scarborough General Hospital. McLetchie, 40, lauded the doctors and nurses at the hospital as well, giving thanks for a safe delivery. “I’m happy. My husband knew it was another boy because he told me that from before. Everybody was telling me it was a girl but I had a feeling that it was another boy. I went through a lot of pain but once he came out safe, I’m happy. Thank God. The doctors and nurses were very nice to me. There’s one that I really like there. They treated me nice. I listened when they told me what to do. When the pain hit me and I started to go off the line, they got me right back on track,” said McLetchie. Reply to "Boys for happy mothers on New Year’s Day"